The Vancouver real estate market has changed drastically over the last couple months. We used to see multiple offers on basically every property, now you’re lucky if it sells (for detached houses anyways). The price drops have already begun. In fact they started in areas like Tsawwassen & Ladner months ago. Now they are becoming more and more evident in other areas. Including much of Metro Vancouver. I tweeted the staggering price increases of areas like Tsawwassen and North Delta which saw the biggest price gains year over year. 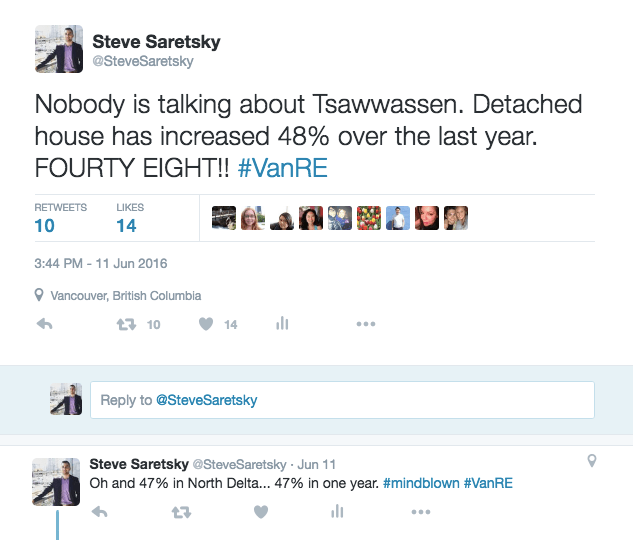 When I tweeted these numbers back in June it showed Tsawwassen detached homes had a price gain of 48% year over year compared to June of 2015. North Delta had a 47% price increase vs June of 2015. These numbers were pulled using Median sales price from REBGV (Real Estate Board of Greater Vancouver). Now let’s look at July stats from the board. Tsawwassen year over year gains dropped to 44%. North Delta dropped to 31%. That’s a 16% drop in one month for North Delta. Again this is Median Sales price which is considered more accurate than average and MLS HPI Benchmark. I discussed this in article written by the Vancouver Sun. As you can see this market is highly volatile and can change on a weekly basis. If you want a good example of this check out the graph below. Tsawwassen Median Sales price $927,500 in September 2015. Tsawwassen detached house prices jumped from $927,500 in September 2015 to $1,359,500 in January 2016. A $432,000 price increase in 4 months! Similar price jumps can be seen in other areas. I just like to pick on Tsawwassen because it saw the largest price jump at one point. It’s also where I got my real estate start and where my Mom has been doing her business for the last 12 or so years. So what does this all mean? With the market slowing and the announcement of the tax we are starting to see some serious price reductions. And as a seller you’re only as good as the last comparable in the neighbourhood. So once your neighbour reduces his price and sells low it sets a new precedent in the area. This then starts a domino effect. A saw couple Realtors bantering bank and forth on Facebook the other day saying sellers simply won’t sell if they don’t get the price they want. Maybe, but when has that ever happened? People always need to sell for various reasons. And if they need to sell they’ll have to accept what the current market is willing to pay. And it appears the current market is willing to pay less and less. Here a couple recent price reductions..
Or how about this nearly $300,000 reduction in East Van. If you want to sell your house then your price will have to be competitive. So just like when your neighbour sold his house several months ago for a record high price, instantly raising the value of your home, this time the reverse will be done when he sells low.